The Analgesia Institute, research foundation dedicated to innovation in the field of pain, organizes a public conference on the occasion of the word pain day. This event will be held on 15 October at 6.30 PM at the IAE of Clermont-Ferrand. The Analgesia Institute wishes to use the world pain day to increase general public awareness of the questions related to chronic pain and wants to make sure that its innovative projects and actions are made known. 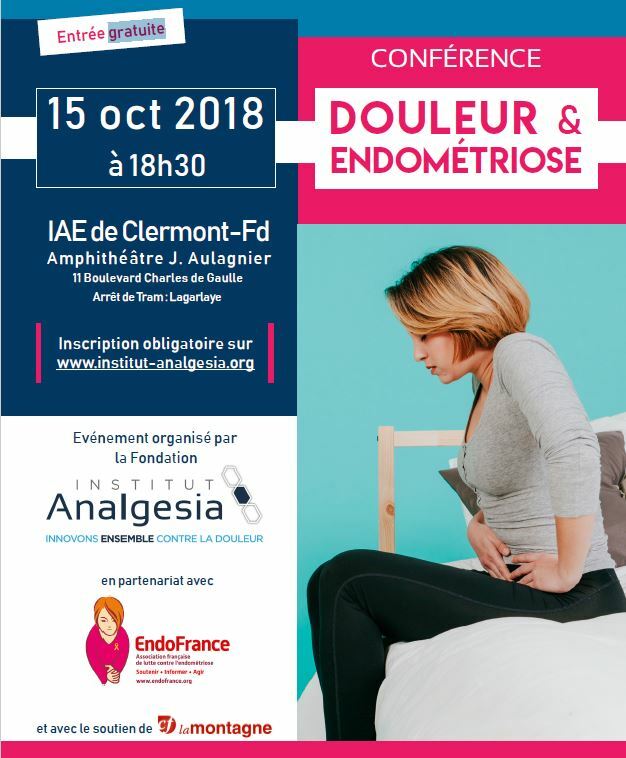 In France, It is estimated that one in ten women of child-bearing age suffer from endometriosis, a total of 3 to 6 million women. Managing these patients is complex: 8 – 10 years are needed on average so that a diagnosis is put, period during which the disease develops and is aggravated (Source: EndoFrance). This conference will be the opportunity to better understand this disease, but also to exchange on the care of patients and on the future developments. Speaker: Pr Nicolas Bourdel, obstetrician-gynecologist at the CHU Estaing of Clermont-Ferrand, with the testimony of a patient member of Endofrance (association partner in the event).